Explore the tabs below to learn more about our middle school curriculum. The focus of the year is American history from pre-colonial settlement until the Revolutionary War. More specifically, we will study major geographical features and regions of the US, indigenous cultures and civilizations unique to each geographical region, European exploration and settlement, colonial life, the Revolutionary War, and potentially the Constitutional Convention. To advance higher order thinking, we will take a multicultural and critical perspective towards these major historical eras and consider the implications of these events on various groups and cultures, and ultimately analyze how history has shaped and continues to shape current society. In other words, history is not a series of dates to memorize, but rather an inquiry into power and attempts to design and implement dis/utopic principles. Each quarter, we will dive into a different field of scientific inquiry: Forces and Motion (physical science), Our Universe (astronomy), Thinking Like a Scientist (scientific method and experimental design), and Energy in Ecosystems (ecology and biology). Science class will utilize a blended learning approach, which will include readings, demonstration, online learning, and experimentation. Much like social studies, our scientific studies will not center on the memorization of content; instead, success in science hinges upon a spirit of inquiry, and creative and logical thinking: science is more about how one thinks and responds to challenges than what one knows! The fifth grade uses a novel based curriculum for literacy. Students read 4-6 novels throughout the year, and are taught critical thinking, analytical and writing skills as we read, discuss and write about each novel. Grammar and vocabulary are infused in lessons and assignments throughout the year. The fifth grade math program focuses on building students’ fact fluency and conceptual understanding of the math content they learned in elementary school. In addition, the program puts a heavy focus on bringing students from concrete to abstract problem solving, challenging them to think deeper into reasoning, communicating, and connecting their skills to what they already understand and do well. Responsibility begins to shifts more onto the students encouraging them to practice neatness and organization. The fifth grade math program uses well known resources such as Singapore Math series, Engage NY, and Math Expressions while supplementing other technology and web-based programs such as Study Island, Imagine Math, and NCTM’s Math Forum. The Middle School Science program uses the resources of Greenfield’s Greening initiative and the surrounding neighborhood to make science relatable to a student’s everyday life. Visits to Waterworks, the river, and Greenfield’s rain garden help bring what takes place in the classroom to life. Whether it is identifying migratory birds or classifying trees, students become familiar with the scientific method and use a variety of materials to develop an interest in science. In 6th Grade: students learn earth sciences: minerals, rocks, impact of water on land and rock cycle as well as weather and climate. Students take trips to Waterworks and track weather via the National Oceanic Atmosphere Association. In 7th Grade: students learn life sciences such as biology, dissection, genetics and adaptations. Much of the work is project-based. In 8th Grade: Students have hand on experience with labs involving chemistry and physics and conduct high level calculations. Middle School Science Teacher Mr. Bentz has been recognized by the Environmental Protection Agency (EPA) as an outstanding environmental educator and received a Presidential Innovation Award for Environmental Educators Honorable Mention for teaching environmental issues and green solutions that extends beyond his students to their families, community members and other teachers in the District. The middle school math program uses a hybrid of curricular resources to support our student’s mathematical growth. The main resource is Houghton Mifflin’s Big Ideas Math, with supplemental materials from Engage New York and many other sources. This program is focused on helping students develop procedural fluency as well as conceptual understanding of the topics in the middle school math curriculum. Students also work at their own pace on differentiated online math programs (Imagine Math and Get More Math) that allow them to remediate or move ahead as appropriate. In eighth grade, students are utilizing TI-NSpire CX graphing calculators to better visualize the mathematical concepts. The calculators connect with the TI-NSpire Navigator teacher’s system, allowing the teacher to quickly send documents and collect data to determine individual students’ and the class’ level of understanding on given objectives. The calculators and the accompanying educational materials from Texas Instrument provide all of our students with a strong foundation in algebra to prepare them for a full year of Algebra 1 in high school. In addition, a small group of students are involved in a pilot program that allows them to work on the Algebra 1 coursework while also completing 8th grade math. At the end of this school year, these students will have the opportunity to complete the Keystone Algebra 1 examination, which is a high school graduation requirement. In order to be prepared for success in high school, elementary students must develop a wide array of solid literacy skills. In Literacy class, students will be routinely engaged in in-depth analysis, comparisons and evaluations of both literary and nonfiction texts. In 6th Grade Literacy, students will begin to move beyond general reading comprehension and into more in-depth analysis and evaluations of both literary and nonfiction texts. Students will engage in a novel-based curriculum. The overarching academic goal of this course is to improve student reading comprehension and writing. Instruction and practice will focus on the development of major literacy and language arts skills: vocabulary, grammar, writing composition and mechanics, reading and comprehension of literature, and reading comprehension of nonfiction/informational texts. Every marking period, a novel is used as a vehicle to teach students specific learning objectives identified in at each grade level in the Common Core State Standards. (Novels are used as “anchor texts”–the centerpiece of each marking period’s curriculum–alongside other literary and informational texts). This is achieved through an instructional process known as Guided Comprehension. We begin with teacher-led, direct instruction of specific content, strategies and skills. I then create opportunities for the students to practice the target skill or strategy individually, in small groups or in pairs–applying what has been learned to the analysis of the novel or supporting text. Over time, instruction gradually shifts from teacher-led guided practice into peer collaboration and on towards independence. Close Reading. In Close Reading, students learn to read, reread, mark-up and annotate texts in order to analyze content for specific purposes. Evidence Based Claims. Students must become adept at being able to support claims with evidence gleaned from the text, and then citing that evidence properly in his or her written responses. Collaborative Discussions. Students interact with the text and one another in engaging discussions, sharing questions, predictions and interpretations within a structured, small-group activity. In order for students to be successful in school now and in the years to come, and reach our high expectations, students must learn a fundamental set of study skills, organizational habits that will help them to accomplish that goal. In Literacy class, we utilize the Cornell note-taking system as a tool for recording and studying new information, and practice organization with weekly time management plans. variety of literary tasks and rigorous academic challenges. successful student in any subject. Our Middle School students tackle the Social Studies curriculum through rigorous examination of both primary and secondary sources. As an example, the 8th Graders will study the Revolutionary War Era by closely reading pieces of Paine’s Common Sense, but will also explore this time period by looking at scenes from HBO’s John Adams mini-series and songs from the Broadway hit Hamilton. Additionally, our students get the opportunity to connect more broad Social Studies topics with current world events. For instance, 7th Graders will finish their study of the Movement of People by specifically examining the ongoing Refugee Crisis and the ripple effects it is having throughout many areas of the world. 6th Graders will study how an economy works as per the curriculum, but we’ll also spend time exploring the role of advertising and the issues created by the use of gender based stereotypes by ad agencies. To coincide with our Middle School Literacy Program, students get plenty of practice using Document and Evidence based writing techniques as part of Social Studies. Overall the goal is to help our students become young adults who can both elegantly craft and defend their arguments and opinions. 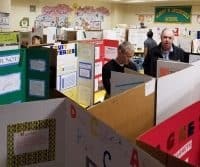 Middle school students have the opportunity to participate in our annual Science Fair which takes place in the spring. Each student applies the scientific method to an individual project that is researched and then presented at the Science Fair. Awards are given within each grade and the event is always a well-attended Greenfield favorite.